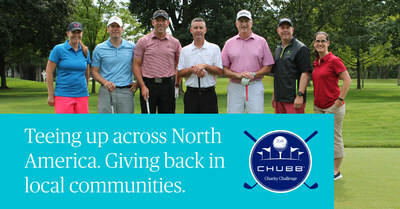 Chubb announces finalists for the 19th Annual Chubb Charity Challenge national tournament, October 28-30 in Kiawah, SC. Regional event winners from across the U.S. and Canada advance to the national golf competition with a chance to win up to $50,000 for their charity. WHITEHOUSE STATION, N.J., Oct. 5, 2018 /PRNewswire/ -- Chubb is pleased to announce the 19th annual Chubb Charity Challenge finals taking place October 28-30, 2018 at The Sanctuary at Kiawah Island in Kiawah, SC. Forty-five teams from across the United States and Canada – the winning foursomes from each of the regional golf events held throughout the year – will compete in the national tournament finals for a chance to win $50,000 for their chosen charity. The roster of teams competing in this year's Chubb Charity Challenge finals, along with their agencies and the charities for which they will be competing, can be found here. "The Chubb Charity Challenge is about playing golf with a purpose, for causes dear to our hearts within the communities where we work and serve," said Chris Maleno, Division President, Chubb North America Field Operations. "Together with our network of brokers and agents, we are building stronger connections within our communities, and becoming better neighbors." Launched in 1996, the Chubb Charity Challenge invites agents, brokers and clients to golf in regional tournaments hosted by local Chubb branches. Competing on behalf of their selected charities, the winning foursome from each regional tournament advances to the national tournament. Since 2000, more than 5,200 teams have participated in the Chubb Charity Challenge, raising more than $15 million for charity collectively. Last year's tournament played host to 345 teams and raised $903,700. "We are proud to be part of an event that gives back to our communities," said Maleno. "At Chubb, this tournament is something we look forward to every year. This legacy and our continued commitment to philanthropy is the story of the Chubb Charity Challenge." Click here for more information about this year's tournament and the charities that have benefitted. Chubb is the world's largest publicly traded property and casualty insurance company, and the largest commercial insurer in the United States. With operations in 54 countries and territories, Chubb provides commercial and personal property and casualty insurance, personal accident and supplemental health insurance, reinsurance and life insurance to a diverse group of clients. As an underwriting company, we assess, assume and manage risk with insight and discipline. We service and pay our claims fairly and promptly. The company is also defined by its extensive product and service offerings, broad distribution capabilities, exceptional financial strength and local operations globally. Parent company Chubb Limited is listed on the New York Stock Exchange (NYSE: CB) and is a component of the S&P 500 index. Chubb maintains executive offices in Zurich, New York, London and other locations, and employs approximately 31,000 people worldwide. Additional information can be found at: chubb.com.